What could be more romantic than setting sail on a fairy tale? Once you step aboard your Disney Cruise Line® ship, you’ll be swept up into a magical world of Disney service, unforgettable dining and world-class entertainment- and you haven’t even gotten to the good part yet. Set sail on an ocean voyage and begin your new life together aboard a luxury cruise liner that offers everything you could ever dream of in a romantic wedding or honeymoon. Enjoy all the excitement of a tropical adventure as well as the world-class services of the Disney Cruise Line®. A cruise wedding is the ultimate romantic adventure. Walk down the aisle onboard one of our magnificent and elegant cruise ships or make your vows on Disney’s private island paradise, Castaway Cay. It’s an unforgettable ceremony on land or sea. As Disney Cruise Line® Senior Officers cannot perform legal ceremonies, the legalities of the wedding license must be taken care of before the ship leaves its departure port. You’re not just taking a cruise. You’re reliving the romance of your wedding day. So set your sails on a magical voyage with Disney Cruise Line and experience the second honeymoon of your dreams with the magic of Disney. 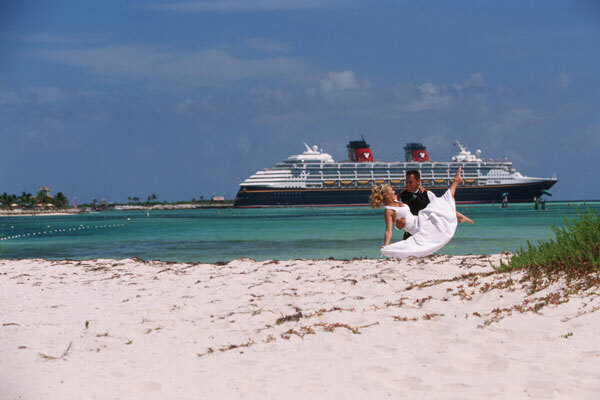 Choose from ceremonies on-board or at Disney’s own private island paradise, Castaway Cay. Wedding and Vow Renewal package options may change, vary by cruise and may not be available on all departure dates. Visit disneyweddings.com for more information.